Despite the fact that he got to make features, and despite the evident quality of his work, Monty Banks never seems to have quite ‘broken through’ to full success. Perhaps audiences were just spoiled in the 20s by having such an outpouring of comedy films (generally two a year from Keaton & Lloyd, plus Chaplin’s sporadic efforts, not to mention Banks and all the other contenders). As a result, it was harder to stand out during a time of such riches. Despite Monty’s films being released by Pathe to replace the Harold Lloyd films they had lost to Paramount, he seems to have not been as financially successful as hoped, leaving him to head to England to escape bankruptcy proceedings in 1928. The Russians though, seem to have been fond of Monty, at least if their wonderful posters of him are anything to go by. 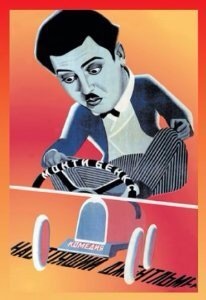 Here’s another great Soviet poster, for A PERFECT GENTLEMAN. I recently watched the BFI’s copy of this film, and it’s an absolute gem of a farce comedy. The English, too, were Monty Banks fans. Making his home there, he was welcomed by the film industry (as with Lupino Lane) as both star comic (‘ADAM’S APPLE’, ‘WEEKEND WIVES’, ‘SO YOU WON’T TALK’) and director (many films, most notably George Formby’s ‘NO LIMIT’ and ‘KEEP YOUR SEATS PLEASE!’ and several with Gracie Fields). In fact, these days he is best remembered as Mr Gracie Fields; they were married in 1940. Certainly, his films need re-evaluating and to reach a wider audience. Based on what I’ve seen so far, they’re great fun.